Neolithic means ‘new stone age’. It is a period of prehistoric archaeology. 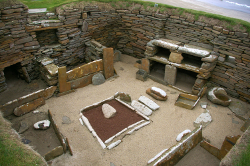 In northern Europe, the Neolithic dates from 4000 BC to 2300 BC. It was during t he Neolithic that people first started farming, instead of hunting and gathering. Neolithic people used flint and stone to make tools, and some of the first pottery was made too. Neolithic peoples were also great builders. They constructed huge henges and stone circles, and began to build more permanent homes.